It’s the last week of sittings for the Michaelmas Term. 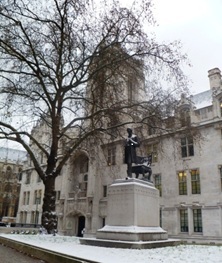 Continuing from last week until Thursday 15 December 2011 in the Supreme Court are the appeals of the Employer’s Liability Insurance “Trigger” Litigation. These relate to the deaths from mesothelioma of employees who had inhaled asbestos fibres at some point during the course of their employment, and the employers or representatives of the employees are seeking to recover loss from the employer’s insurers. The issue for the Supreme Court to decide is what constitutes the “trigger” for liability of an insurer to indemnify the insured within the policy period; in these cases whether it is the tortious exposure of a victim to asbestos dust, or the onset of mesothelioma. For individual case details please visit the following: BAI Ltd v Thomas Bates and Son Ltd, BAI Ltd v Durham, Municipal Mutual Insurance Ltd v Zurich Insurance , Municipal Mutual Insurance Ltd v Zurich Insurance Company and Adur District Council and Ors, Independent Insurance Company Ltd v Fleming and Anor, Municipal Mutual Insurance Company v Zurich Insurance Company and Ors, Excess Insurance Company Ltd v Edwards, Excess Insurance Company Ltd v Akzo Nobel UK Ltd and Excess Insurance Company Ltd v Amec plc. Starting on Wednesday in Courtroom 2 of the Supreme Court is the two day hearing of In the matter of Peacock, which will be heard by Lady Hale and Lords Hope, Walker, Brown and Wilson. The appellant was previously convicted of drugs offences and was subject to a confiscation order for the amount of benefit he had received from drug trafficking, calculated at over £270,000. His realisable assets were calculated as £823 and that sum was paid over. After the appellant’s release from prison he acquired assets through legitimate means and a certificate of increase in the appellant’s realisable assets was obtained by the crown under the Drug Trafficking Act 1994 s16(2) and s31. The appellant contends this being granted in reference to assets acquired after the date of conviction. The issues for the Supreme Court to determine are whether s16 has been repealed by the Proceeds of Crime Act 2002 (Commencement No. 5 Transitional Provisions, Savings and Amendment) Order 2003, whether the Crown has jurisdiction to grant a certificate of increase in reference to assets acquired after the date of conviction and whether it is contrary to ECHR Art 6 for a defendant to be liable in perpetuity to a penal sanction. The case details are available here. On Wednesday 14 December 2011 the Supreme Court will hand down the following judgments: R v Gnango, Secretary of State for Work and Pensions v Payne and anor and the linked appeals of Edwards v Chesterfield Royal Hospital NHS Foundation Trust and Botham v Ministry of Defence. There are no hearings or judgments scheduled in the Privy Council this week. 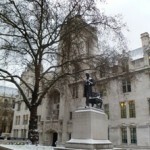 Leave a reply on "In the Supreme Court w/c 12 Dec 2011"